Only 40 Days Away, So Register Now! 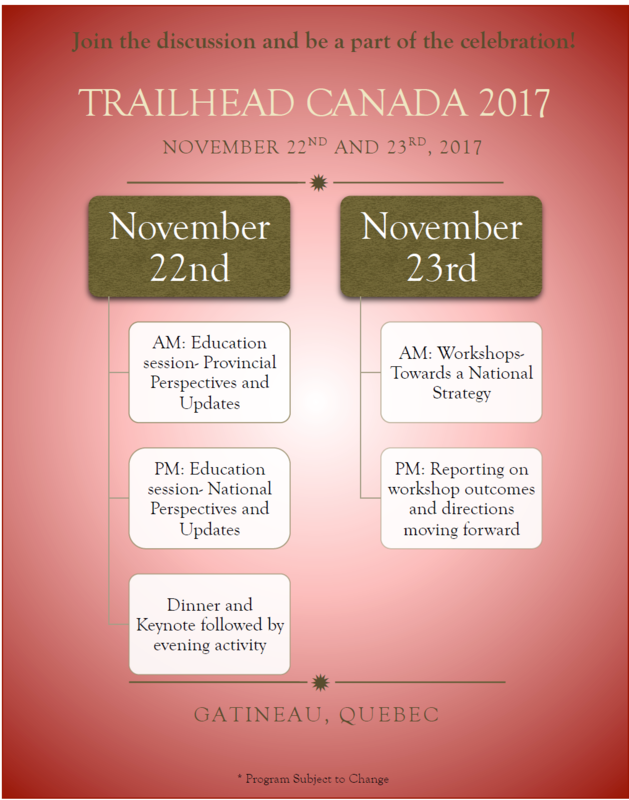 Join Organizations And Representatives From Around The Nation As They Gather In Gatineau And Ottawa To Develop A Framework For A National Trails Strategy. 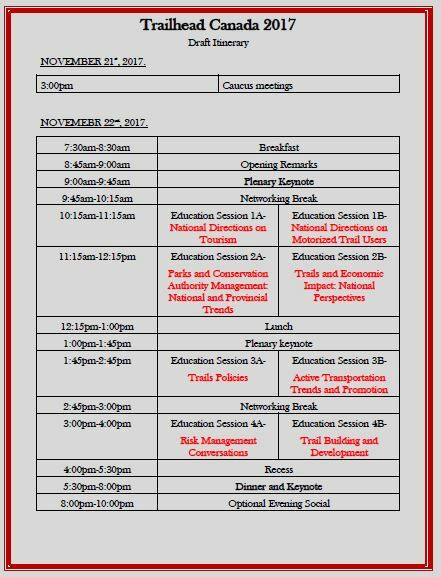 Representatives from provincial and national parks and trails organizations, policy makers, granting organizations and trail developers will all be present during the 2-day conference to collaborate on a framework that will align trail priorities and practices at the national level. 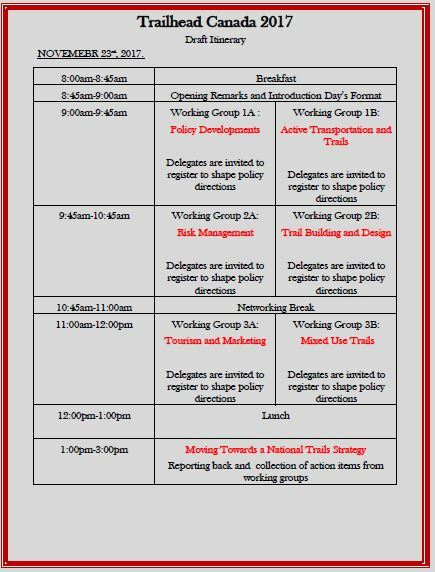 Ensure Your Organization’s Voice Is Heard by attending the conference and contributing to a truly national framework that will one day lead to a nationally recognized gold standard in trail practice. Patrick Connor BA (Hons) C.A.E., S.S.A. 8) As a Trailhead Canada’er you can lead the nation with your work group input. 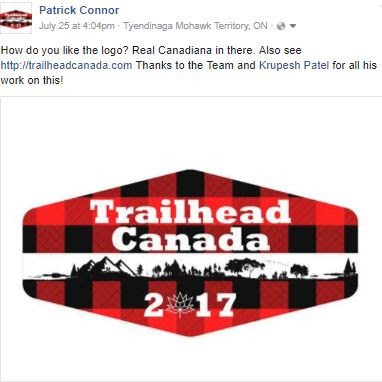 Ontario Trail News 13/07/17 Trailwise – New Trail Publications, Trail Stories, New Trails Opening, Trailhead Canada Program and Trailhead Events! Long before Ontario was covered with sprawling stretches of multi-lane highways, the Indigenous communities of the region had their own widespread transportation network. 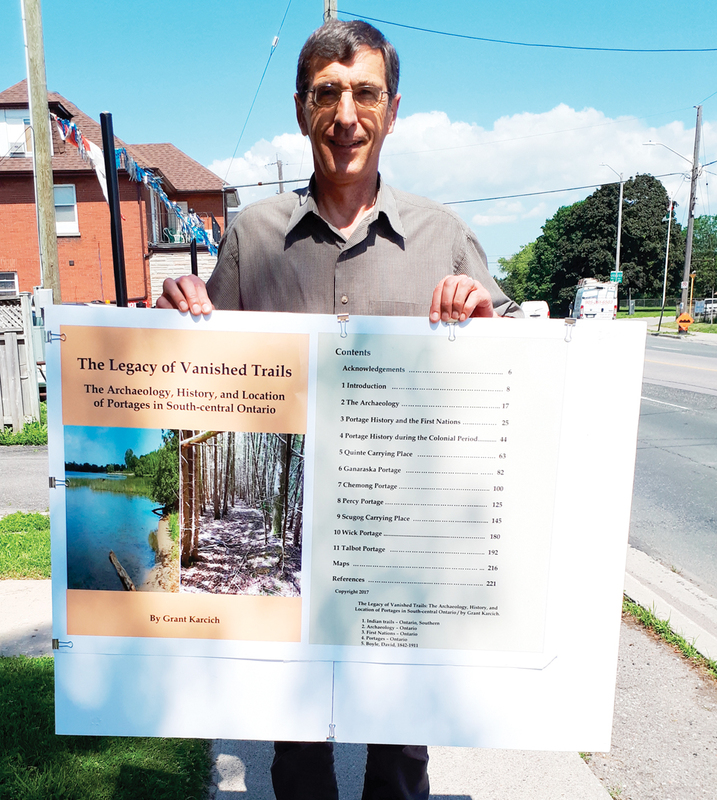 In his new book, The Legacy of Vanished Trails, Oshawa-based author Grant Karcich takes an in-depth look at the trails and portages that made up those networks. 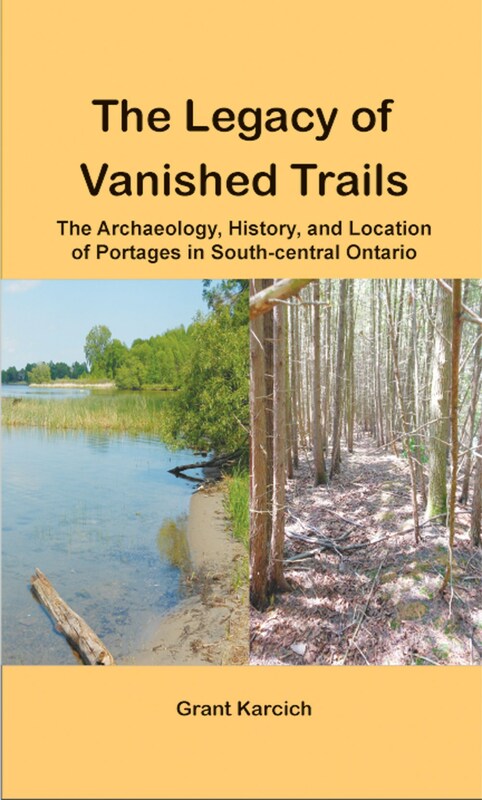 According to Karcich, the book “extends the story” of his previous publication, Scugog Carrying Place: A Frontier Pathway, by examining historical trails and portages, which helped to increase co-operation between Indigenous peoples and European settlers and provided pathways to undiscovered portions of what eventually became Ontario, in their ‘modern settings’. “This book tries to answer questions such as ‘who were the First Nations people in Durham and how did the Indigenous communities north of Lake Ontario develop?’”, Karcich explains. Karcich said there has been relatively little written about these trails and portages and he wanted to highlight their importance in the settlement of not only Durham Region, but the entire province, as he examines portages in areas such as Toronto, Peterborough and the Bay of Quinte. The book also includes photographs, maps and information on artefacts that have been discovered in the vicinity of these historical trails and portages. 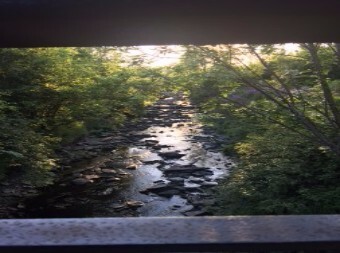 Over the past 150 years, Karcich said the once bustling routes have “primarily been left abandoned” but “some bits and pieces” remain. Karcich said he began writing The Legacy of Vanished Trails about two years ago, and this time around, he went the self-publishing route, creating Red Handprint Press. “Who knows I might be able to publish more books, there’s still a lot out there [to tell],” he says. The Legacy of Vanished Trails is available online at redhandprint.ca and will also be on bookshelves in several locations. Karcich will be hosting at book launch at CORE21, 21 Simcoe St. S. on June 13 from 4 to 6 p.m.
from Liz Thorne, windsordotcanews High lake levels have caused significant erosion to the shoreline at Holiday Beach according to the Essex Region Conservation Authority, resulting in limited beachfront and in some cases, downed trees. Holiday Beach is open from dawn to dusk daily. Belleville is hoping to get some major provincial funding for its bicycle lanes programs over the next few years. The province has announced its Ontario Municipal Commuter Cycling Program, a four-year cost-sharing funding system for cycling infrastructure. City council has approved applying for the funding for its 2017 projects, which include Bridge Street West connecting Loyalist College to the downtown, the Northeast Industrial Park extension, and the Station Street – Haig Road extension. The 2o17 plan also calls for 3.6 kilometres of lanes on Bridge Street East and a designated biking route east of the Moira River. If the application for the $3.3 million worth of work is successful, it would mean the city would only have to pay $710,000, with the province picking up the remaining $2.6 million. RFP for Non-Motorized Trail Pan for North Hastings Released. We are pleased to attach our RFP for the development of a Non Motorized Master Trail Plan for North Hastings. Please share with your networks and contacts as required. Having had discussions with you over the past year, we wanted you to have an opportunity to provide your response for this initiative. 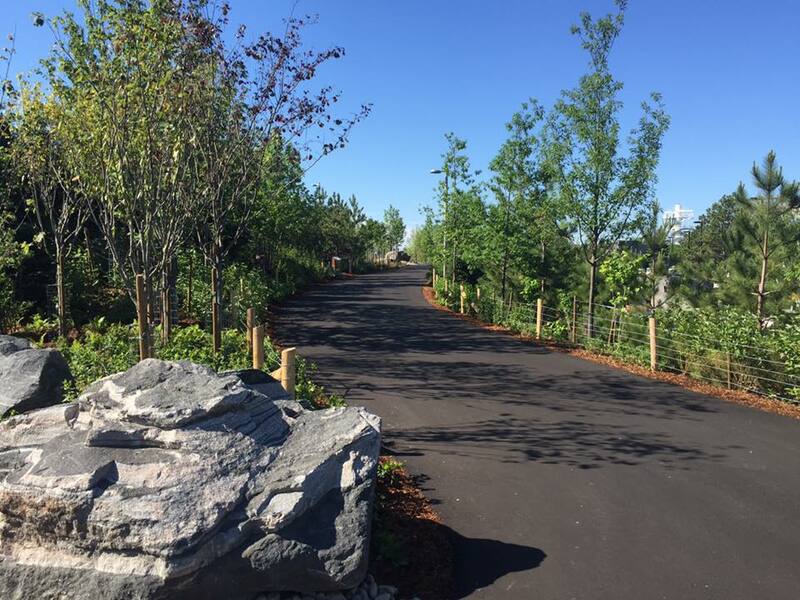 The North Hastings Municipalities are collaborating on the development of a network of Non-Motorized Trails (NMTs) throughout the region as a means to better address their residents’ desire to improve opportunities for active, non-motorized outdoor recreation as a means for community health and economic development. To accomplish this vision, they are working under the authority of the NHEDC to undertake several initiatives, the most important of which is the development of the North Hastings NMTMP to guide municipal decisions concerning the long-term governance, management, sustainability and administrative practices of NMTs throughout the region. 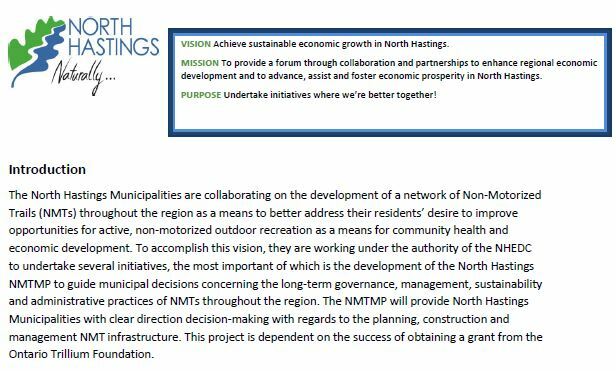 The NMTMP will provide North Hastings Municipalities with clear direction decision-making with regards to the planning, construction and management NMT infrastructure. This project is dependent on the success of obtaining a grant from the Ontario Trillium Foundation. Note SEED submission to OTF submitted February 21, 2017. 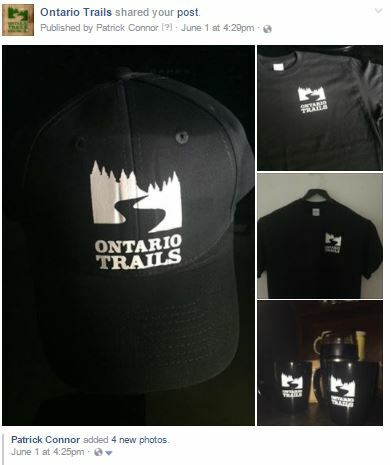 Support Trails – Order your ball caps, mugs or OTC Shirt now! Quantities are limited. Outlet Beach at Sandbanks Provincial Park has received Blue Flag designation, an international eco-certification recognizing the beach as clean and accessible with great water quality, high safety standards and excellent shoreline and ecosystem protection. 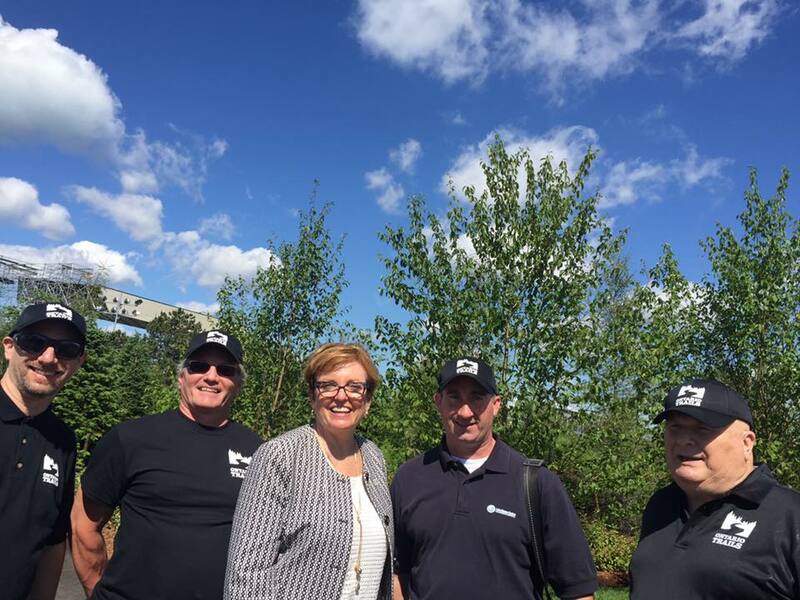 Minister of Natural Resources and Forestry, Kathryn McGarry was at Outlet Beach today to raise the flag and celebrate this award along with Ontario Parks staff. 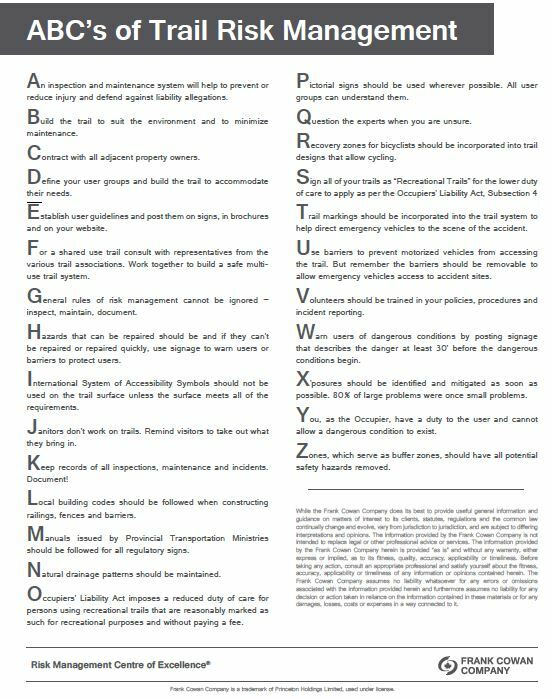 To receive a Blue Flag, beaches and marinas must meet high international standards in four categories: water quality, environmental management, environmental education, and safety and services. Camping on one of the more than 600 campsites including waterfront camping, tenting sites or trailer sites with electrical hook up. Swimming, fishing, boating and a Visitor Centre with educational displays. Hiking through multiple trails, including the accessible Sandbanks Dune Trail home to the largest dune system of its kind in the world, and rare wetland habitat that supports wildlife and unusual flora. Canoeing the Outlet River and exploring its marsh habitat. Ontario Trails Council supported Friends of Sandbanks Provincial Park enabling two significant trail projects to occur through the National Trails Coalition Program in 2009-11, and 2014-16. 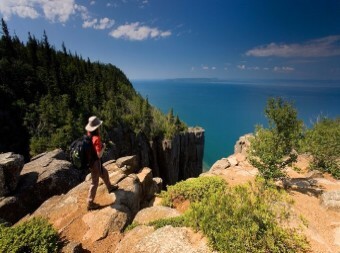 Ontario Trails All Year Long! 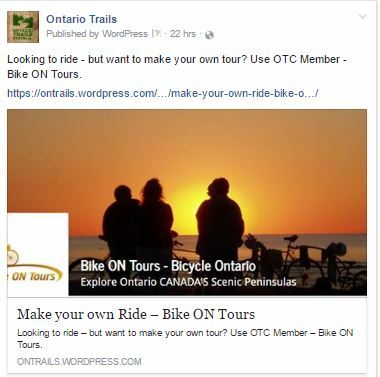 Add an Ontario Trail Logo to your website! Watch for it on our social media, our facebook page and in our twitter feed. Tell us all about your trail event and join us as we celebrate Ontario’s Trails! 1. Log in Your Event – Event spreadsheet. 2. Add your event to our event calendar – add it here. We’ve checked the links, if something isn’t working simply give us a call – 613-484-1140. 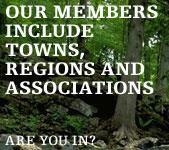 We’ll be adding these links to the various relevant trail pages in your regions and RTO’s/DMO’s over the upcoming year! 5. Send us your Trails video – we’ll be posting content on-line at https://goo.gl/Fy2bIL and we’d be happy to add to our trails tube – https://www.youtube.com/user/ontrailsMissing? You may want to talk to us about OTC Membership. 613-484-1140 We’d be happy to connect with you. In Spring of 2018 trail enthusiasts and supporters are headed to Sault Ste Marie for two days of meetings and lively discussion about all types of trails. Our hosts invite you to join us to hear stories from wood and river, hill and valley. We will be talking about the great adventures we share and how to get more folks to love the outdoors the way we do. 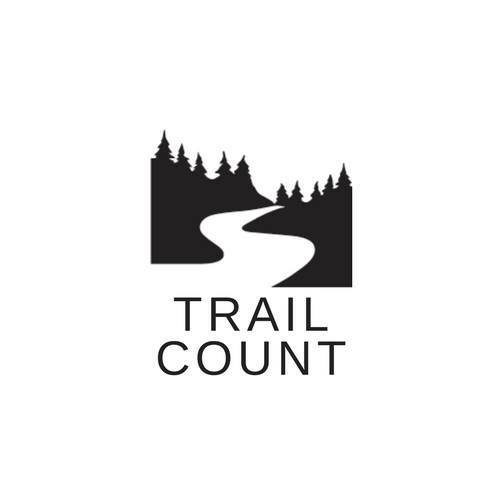 We need your input!In 2015 we secured 101 respondents to our “The Value of Trails – Measuring the Economic Impact of Trails Survey.” We’ve added 18 more to the 2017 updates. We have a ways to go. Click through the screen capture below to access the survey. 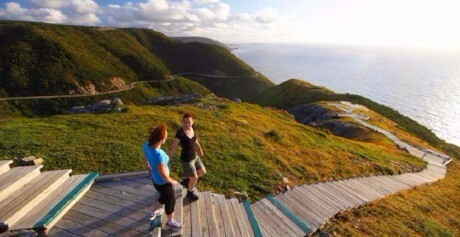 There are many metrics to measure in determining the economic impact of trails, and tourism in just one factor. In order to accurately represent a closer economic impact of trails we are requesting your speedy response to our Call to Action for Your Input to our Value of Trails 2017 survey. With your help we will make an even stronger case for trails and the supports you require to provide a top notch experience at each of your trail destinations. We are also accepting new responses! Many Thanks! 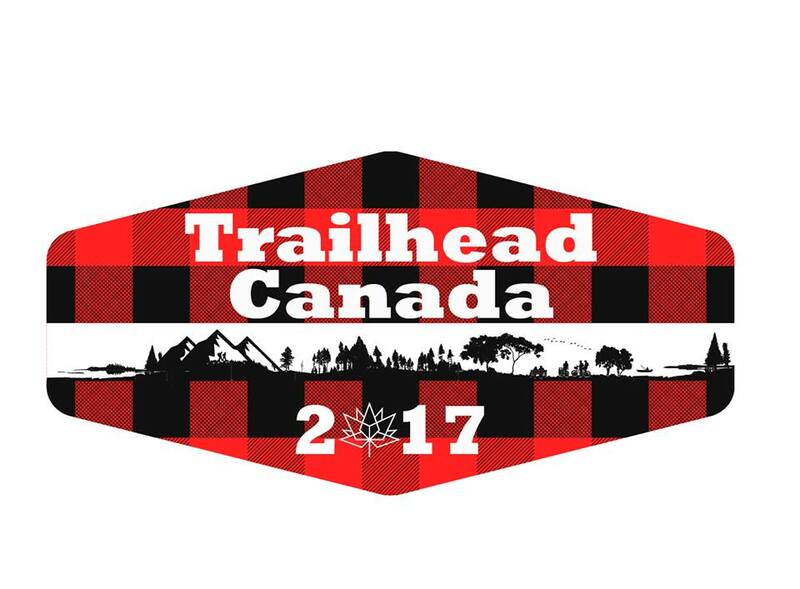 Trailhead Canada – Program Outline Update and Live Registration! Membership Renewals – Thank-you for your Support! We wish to thank the organizations that have already renewed for 2017. We couldn’t do our work without your support. Many thanks! 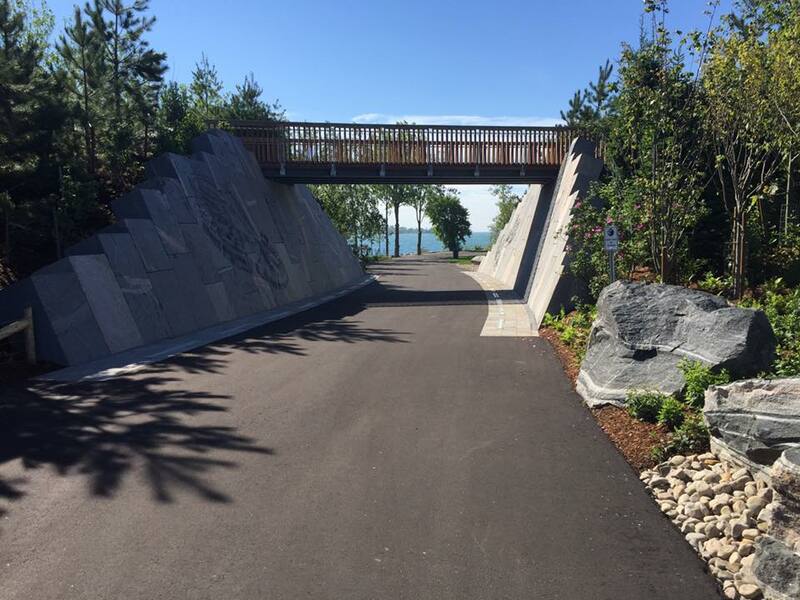 Ontario Trails Council received an invite from the Office of the Premier to attend the opening of the William Davis Trail at Ontario Place June 19, 2017. Jack de Wit, President, Dan Andrews Secretary Treasurer, Joey Schwartz of the Toronto Bicycling Network and a proponent of the Toronto Trails Committee development and Patrick Connor attended on behalf of the Ontario Trails Council. 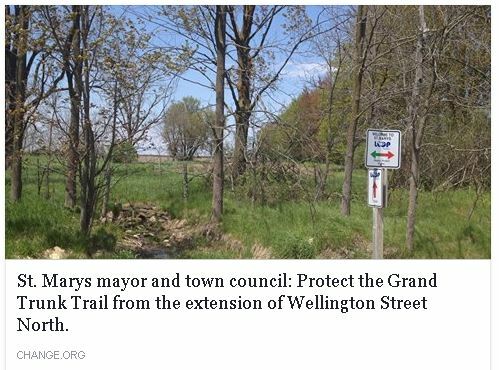 It’s important to attend these developments as it represents a local chance for many of the public to learn about trails. ALready signed as part of the Great Lakes Waterfront Trail, OTC Member GLWT Marlaine Keohelr and David Crombie also attended. The Premier and the Minister spoke from the podium. As did Mississauga’s of the Credit. One of the most important interactions for the OTC took place on the way out where we had a chance to talk with Chief Reg Niganobe and with Elise King who is working with Terri Hamilton at Credit Valley Conservation on the Credit Valley Heritage Water Trail. Our discussion centred around funding and mutual support. 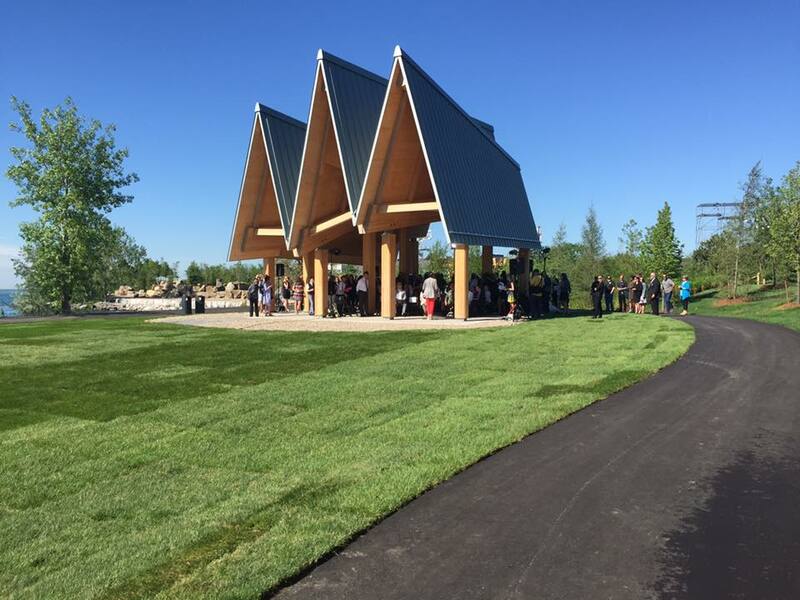 Ontario Trails Council looks forward to assisting this first nation on any way we can. OTC reinforced to the Minister, the value it places on the expert staff of MTCS and the processes we have put into place. 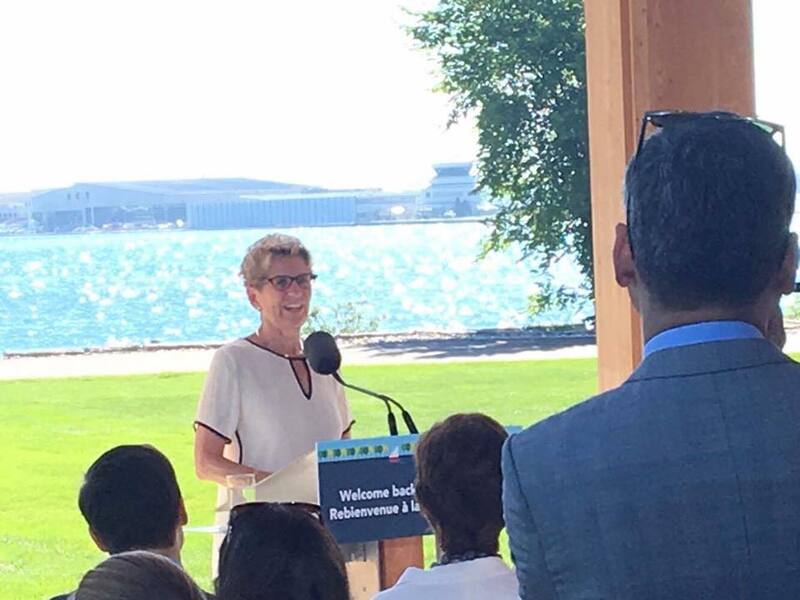 OTC also reinforced with Minister’s office staff our desire to meet with the Minister and as an organization working throughout Ontario – the OTC will go to any announcement or any trail opening in support of the OTS, Bill 100 and the Trails Action Plan. On June 19th representatives from OTC met with Cowan Insurance, one of Canada’s largest municipal underwriters and insurance brokers to discuss ties to the education and risk management programs OTC provides. OTC programs and recommendations mirror or duplicate the very recommendations tha Cowan makes to it’s policy holders. So we discussed partnership and synergies. The content is correct, we are both educating and we want more principle in practice. We reached an agreement in principle to work together better for trail safety, and an understanding of why trail safety and product integrity is so important – especially when encouraging use. OTC staff will be meeting with Cowan trail auditors, and with the OGRA and roads product assessors to determine next steps to enact an Ontario Good Trails Program. We look forward to this industry and trail sector collaboration. 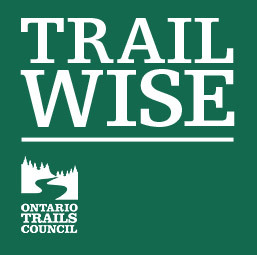 It should also be noted that there will be parallel supportive practices arising from the ongoing Ontario Trail Strategy – Ontario Trail Action Plan trails classification program currently in development with the classification expert panel. Please share this notice through your networks to people who may be interested in this project. Where is the Beare Hill Park site? The Beare Hill Park site is located in Scarborough (see map attached), south of Beare Road. 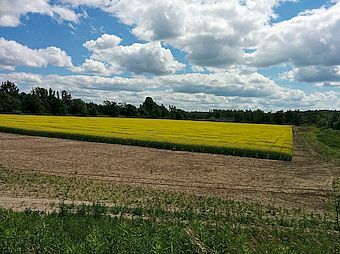 This site is bounded by Finch Avenue East to the north, the Toronto/Pickering town line to the east, a CN Rail corridor to the west and a hydro corridor to the south. The proposed Beare Hill Park site is adjacent to the Rouge National Urban Park and the Toronto Zoo. 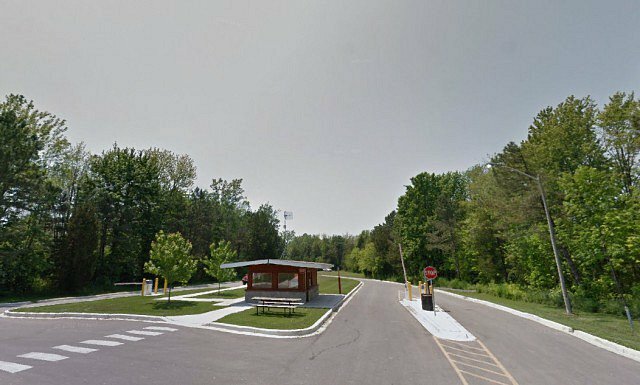 The community was previously engaged to participate in three public meetings that led to the development of the Beare Road (now Hill) Park Master Plan in 2013. This detailed design project involves the preparation of detailed studies and designs that will be used to tender the construction of the park. 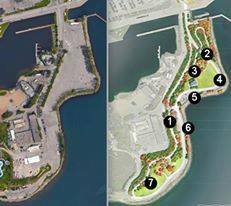 The park design reflects the Master Plan, however, there have been some minor changes that the City is looking for input on. For more information about Beare Hill Park please visit: http://bit.ly/BeareHillPark. Membership Renewals – Thank-you for your Support!We wish to thank the organizations that have already renewed for 2017. We couldn’t do our work without your support. Many thanks! 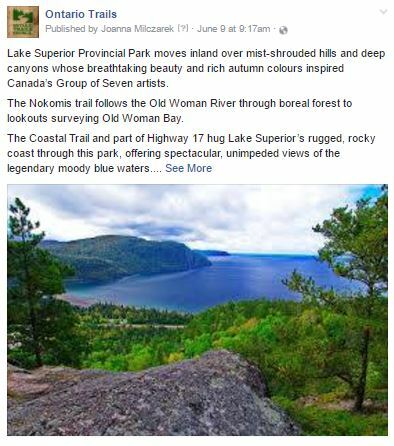 Ontario Trails News – Trailwise, join today! Why not go for a self tour on an bike on an Ontario Trail? 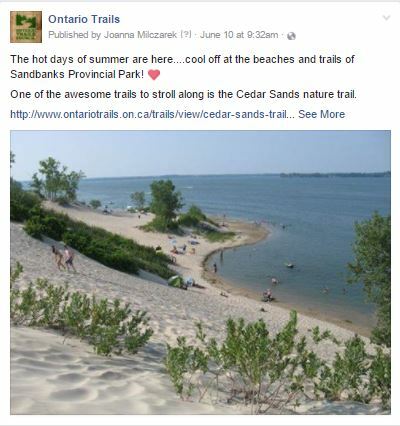 Why not check out the trails at Sandbanks PP? 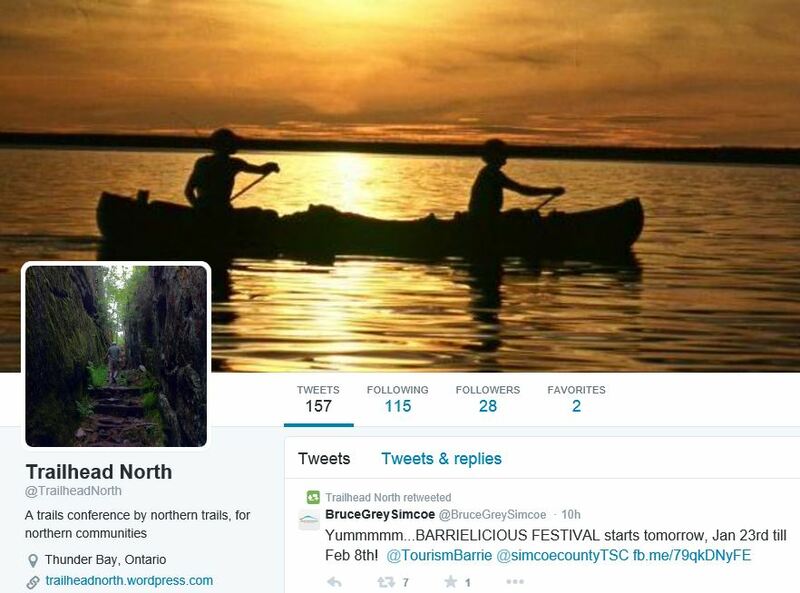 Lake Superior PP is waiting……. 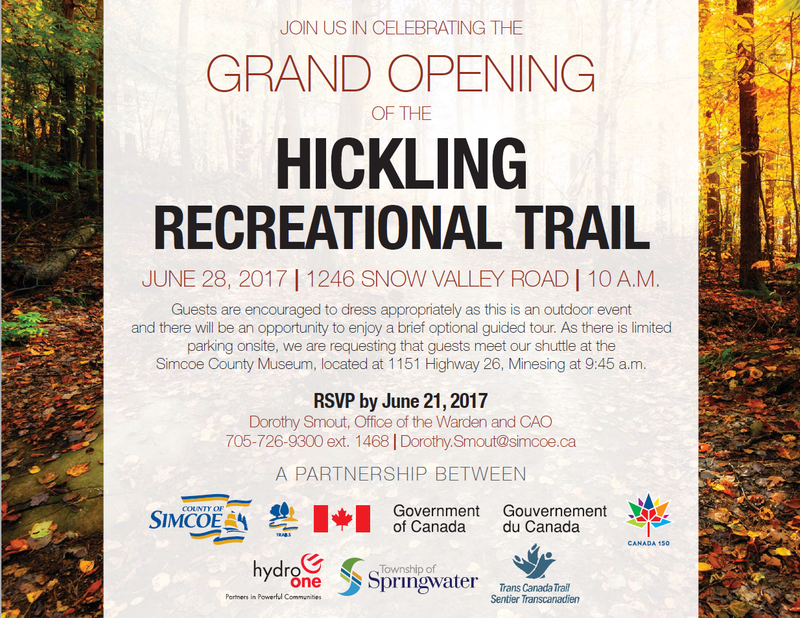 Hickling Trail Opening – a “Happy Trails” project. 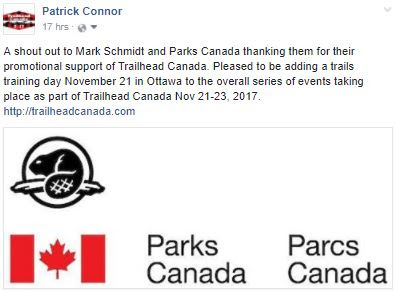 Congratulations to all the groups that made this trail happen! 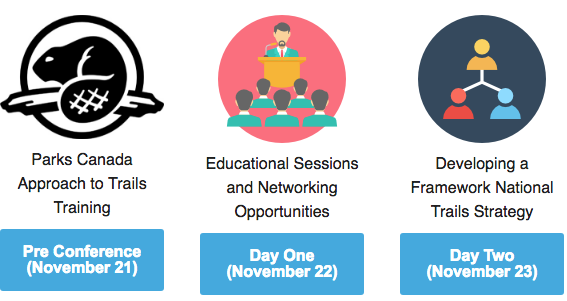 Be Sure to Check out the Great Line Up of Presenters for Trailhead Toronto!